I want to remember a dear friend with very close links to Jaguar, and his name is Michael Cook. Mike died this past week at 85 from pneumonia after a short illness. We first met in Leonia, New Jersey in the early 80s when I was on a whistle-stop tour of a number of global Jaguar markets, and we became instant friends due to our shared love (folly?) of British marques. Our mutual enjoyment of modern jazz also helped cement our friendship. Mike bought his first British sports car, a Triumph TR2 in 1958, and shortly after became PR Manager for the company, which over the decades, had a variety of operating names, but the brands he promoted included Triumph, Rover, MG and Jaguar. I joined Jaguar Cars North America in 1990 as PR VP and Mike worked alongside me until Jaguar's disastrous fall in sales in 1991, forced us to offer retrenchment packages to a number of loyal, and long-serving employees, which included Mike. However we remained loyal and true friends from that moment on. 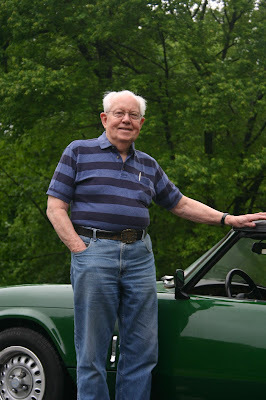 He helped ease me into a relationship with the Jaguar car club organisation after he had left the company, and his imprimatur, gave me instant credibility with a sometimes fractious, but fiercely loyal group of Jaguar enthusiasts. Along with another dedicated Jaguar fan, the late Karen Miller, they managed a fantastic archive at the company headquarters in Mahwah, NJ. Anything you wanted to know, or wanted to trace, about Jaguars sold in the USA, Mike and Karen delivered. He was a disciplined, old-school journalist, and edited two magazines (for Jaguar and Triumph enthusiasts), and always, but always, retained a sunny, devil-may-care attitude to life - as long as he didn't spend too long away from his big collection of jazz on vinyl, especially his much-played Miles Davis catalogue. We corresponded regularly from 1991 up until just before his death, poking barbs at various things we found funny, ironic, or just unbelievable. I will miss his humor and laconic and loyal friendship. So long Mike Cook, we had a good time together.